Winner of the Lanson Award for his wine travel broadcasts on BBC radio, Hamish Marett-Crosby takes a wine and food lovers’ journey around some of the great, and lesser known, wine areas of Europe. What more natural place to start than France, where Hamish will take you through Burgundy, the Rhône, the Loire and beyond. For each of the regions Hamish will evoke the best of wine, food, culture and scenery. In this installment, he continues his journey south from the Rhône Valley, to take in the mountains, valleys – and wine – of the Haut Languedoc. Imagine an area with villages clinging precariously, vertiginously – and in cases optimistically – to the steep slopes of the mountains. Colour that picture in your imagination with an intense summer heat and, from across the valley, study the tiled roofs of the houses which seem to climb up the slope like some designers “genuine” Provencal steps. 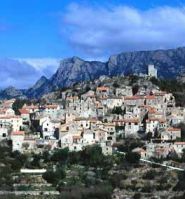 But, this isn’t Provence, it is the Parque Regionale de Haut Languedoc and around these designer villages, bordering the national park, lie the vineyards of St Chinian.As unremarkable little towns go, St Chinian is well up with the leaders. Its regional importance comes from being on a route nationale along which provides a continuous stream of heavy trucks to rumble through the town; a procession made worse by the RN 112 being, in this region, the only way through the mountains of the south from the central south western towns of Albi, Figeac, Castres and the rest. However the wine region of St Chinian is more than one small town. As the publicity has it, it is twenty villages and one appellation. The town may not be the highlight of a touring holiday but the region is “worth a special journey”, as Michelin might phrase it. The wine district includes the plain of vines making up most of the wine area and then the terraced vineyards climbing up from the rivers into the high country of the Haut Languedoc. It is here that awe takes over from the more casual “look at that view”. Excursions by car, bicycle or by foot – and don’t forget the heat when optimistically setting off – can take in towering massifs, seemingly endless forests, high mountain lakes and then there are the orchards. Cherries, apricots and peaches fresh from the trees with a taste unknown to us from northern regions (where imported fruit is allowed to “ripen” in transit). This is the region where, in the summer, a morning’s excursion develops into a busy afternoon round the hotel pool, toiling over major decisions: what time shall I have my dinner and, given the circular nature of the hotel pool, do I swim round it or across it? Of the villages, Olargues attracts with its cobbled streets leading up the hill to the medieval tower. It is approached by walking across the thirteenth century Devil’s Bridge over the river Jaur which itself creates a valley at the foot of the mountains heading from Lamalou-Les-Bains to St Pons and beyond or, if you prefer to navigate by strange names, from the Forêt des Ecrivains Combattants to the Forêt des Crabes Mortes. It is a region of awe-inducing mountains highlighted in the early summer by great splashes of yellow broom and flowers of various hues growing in the most unlikely places. Then there is the smell of those flowers and the wild herbs which activate the saliva glands to make you long for that dinner on the terrace, with the crickets providing their own individual form of muzak and, of course, St Chinian to wash down the food. Languedoc is too large an area to make an sensible generalisation about its wines other to say that in a vineyard with three times as many vines as Australia, if it can be grown it will be. Just over the hills from St Chinian is Beziers which used to be plumb in the middle of the European wine lake, but this is no longer the case. Huge investment has come from other parts of France, as well as from other countries; new grape types have been planted and new wine making technology introduced. Vast amounts of wine officially classified as “vin de table” is made, much of it rivalling in taste, certainly in price, the smaller regions which still cling to the French system of geographical appellation such as St Chinian. The guaranteed weather and the absence of laws which serve to constrain innovative wine makers in appellation areas give these new companies of the Languedoc an air of excitement and confidence you find in the new wine producing countries. It is no surprise to hear the whole region described as France’s answer to the New World. Now in what once the wine lake we can find new ranges of wines being produced from the best grapes gathered from all round the region. And that’s the irony. Growers in smaller areas such as St Chinian once lobbied to be granted appellation contrôllée status in order to stand apart from the local plonk and so realise higher prices on the international market by being better known. Yes, they are becoming known but that is no guarantee of a good price in a fiercely competitive environment, and the irony is that many of the growers find they can get higher prices for their grapes by selling them to the big producers round Beziers where they will be made into branded table wine. The discomfiture of some of the small Appellations comes with the realisation that the French system is purely geographical and not necessarily hierarchical and so prices do not follow the wine law. This brings good news for the consumer – prices are reasonable – the world may not be rushing to buy St Chinian, for example, but that is no reason to miss out. The powerful and dramatic backdrop that is the landscape defines the wine in this instance, and no simple beguiling drink is going to come out of it. Indeed, as the landscape varies so does the wine, varying from the relatively soft and appealing (though rarely so approachable as most New World or New Languedoc reds) to the full, dark and tannic, even if the local rosé is light, dry, fruity and immediately tempting. Some of the red wines attack the taste buds in the same way as the scenery attacks the visual senses – dramatically – and can be full of tannin and correspondingly difficult to appreciate. Perhaps, as a restaurateur informed me, it could do with a few years in the bottle. Quite, but unfortunately I was drinking it that night, so why did he sell it to me?That’s a story for another time and another place. Like all good relationships, however, getting to know St Chinian is one you have to work at, but it is a serious wine which goes with the serious food in the region. And one final tip if, when travelling in France, you are presented with a wine list and on it you see a reasonably well priced but unfamiliar petit château of Bordeaux, take a look under the regional wines and see if St Chinian or its near neighbour Faugères is listed. For the same price you will, in all likelihood, get a much more satisfying bottle of wine.